2 What is Infratonic 9? Stress is normal physical response to anything that makes us feel threatened or upset. Modern life has, unfortunately, brought us a lot of deadlines, frustrations and demands. Sometimes stress could be positive – it can help you in better work under pressure and motivate you. However, when you are constantly stressed, your body is suffering. Also, some people do not cope with the stress as well as others. That is why sometimes it is necessary to find any kind of stress relief, and not only to cope with it on a daily bases and suffer. 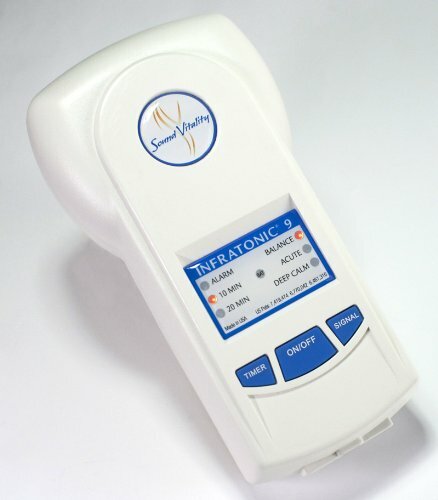 TheInfratonic 9 is a drug-free way of relieving stress and pain. It releases sound waves and helps in stimulating the blood circulation and lymphatic and nervous system. With the help of sound frequencies, it moves old fluids out of painful areas and draws fresh one in order to help in fast healing. This is the best natural pain relief – no medicine, drugs and side effects to hurt your body. Infratonic 9 is upgraded version of Infratonic 8. Primarily, this kind of therapy was used to treat pain in racehorses. But, when doctors have seen its effects and tested it, it found its use in pain relief for people too. Infratonic 9 is battery powered and portable, so you can take it anywhere with you. As the successor of the Infratonic 8000, the Infratonic 9 has the same timers and settings, but is also much more powerful. Another improvement, which made it better for use, is battery powering. Now it can last 50+ hours per charge. In addition, it is cord-free! Safe, easy to use and helpful – what else could you need? While on stress, your body, muscles and stressed-out nerves are tight, unable to contract or relax. Infratonic 9 helps in elimination of this kind of state by releasing the soothing sound waves. Sound waves penetrate deeply into tense muscles and nerves causing traumatized cells to open. Their vibrational nature gently sweeps the cellular trauma away, along with the pain. This therapeutic massager has a miraculous effect. After usage you are about to feel relaxed and refreshed instantly. This way you will be ready to handle all unexpected future events. It has been proven by many users to relieve pain, stress and tension, relax muscles, reduce inflammation and speed healing. I’ve been using Infratonic units produced by Sound Vitality for 20+ years. This includes personal & professional use as a massage therapist (LMT) & Holistic Health Practitioner (HHP). My first experiences with Infratonics were during my holistic health education while attending Pacific College of Oriental Medicine. Accelerated recovery results have included numerous health challenges/conditions including sports injuries, whiplash, chronic pain, muscle tension, headaches, carpal tunnel, arthritis, etc. We’ve had 2 units around the house for a number of years & use them regularly with positive results. I’ve found a reliable source of relief from chronic foot pain (high arches & a bone spur on my heel) & would never want to be without an Infratonic unit close at hand. Blessings of aloha & gratitude to everyone at Sound Vitality for their continued service.